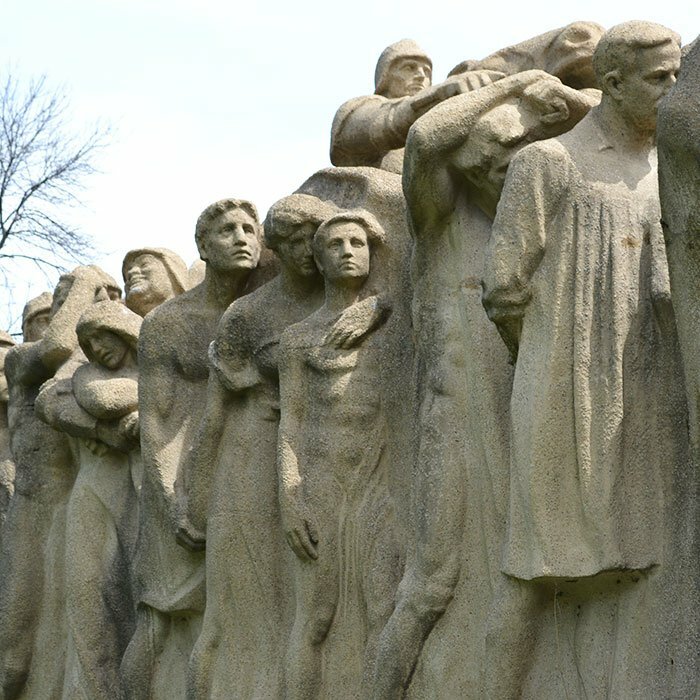 Perhaps no other sculptor has played as prominent a role in Chicago as Lorado Taft. After receiving his education at the University of Illinois and the prestigious École des Beaux-Arts in Paris, the Illinois-born artist moved to Chicago and quickly began cultivating a new generation of Midwestern sculptors by teaching at the School of the Art Institute of Chicago. Many of Taft’s students were young women, and he proved an advocate for them at a time when bias prevented many female sculptors from securing work. When Taft was commissioned to work on the 1893 World’s Columbian Exposition, he brought along several of his talented female students as assistants, a group that became known as the White Rabbits. After he completed the elaborate ornaments that decorated the fair’s Horticulture Building – allegorical figures, vegetation, nymphs, fauns – he oversaw the installation of sculpture on most of the buildings of the exposition’s magical White City. Taft’s success at the fair won him a national reputation and led to monumental work, especially in Chicago. He became a prominent educator and writer and continued to support and encourage his female students, spearheading several large monuments in which figures were sculpted and designed by individual students. When he moved his studios to the Midway connecting Washington and Jackson Parks on the South Side in 1906, he provided rooming and lessons to students and assistants. It was in these studios (which today house the University of Chicago’s visual arts department) that Taft worked on the two large-scale works for which he is best known. 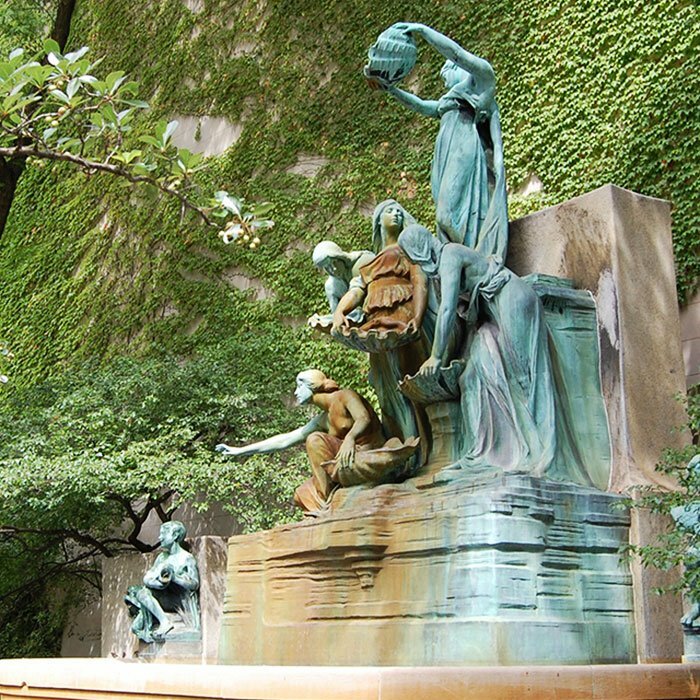 The Fountain of the Great Lakes, now located in the south garden of the Art Institute, depicts each of the five lakes as an idealized woman. 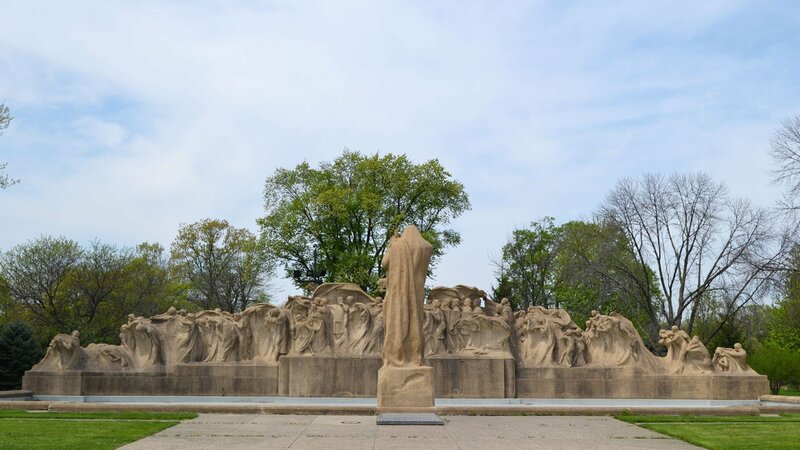 As part of an ambitious but mostly unrealized plan by Taft to transform the Midway into a sculptural garden, he created his most impressive work, the Fountain of Time. Located at the west end of the Midway, it was to have a counterpart on the east end in the Fountain of Creation, which was never completed. 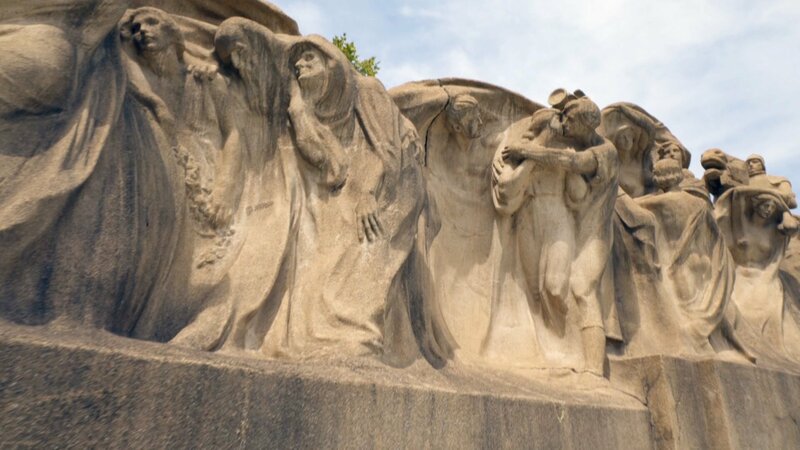 Take a walking tour of lesser known works of public art in downtown Chicago, including Taft’s Fountain of the Great Lakes. Taft envisioned the Fountain of Time as “a colossal work of sculpture” in which “the mighty crag-like figure of Time” watches “with cynical, inscrutable gaze the endless march of humanity – a majestic relief of marble.” But the project grew too large to be executed in marble, so Taft turned to a new type of cement – later used on buildings such as the Bahá’í temple in Wilmette – mixed with crushed pebbles. 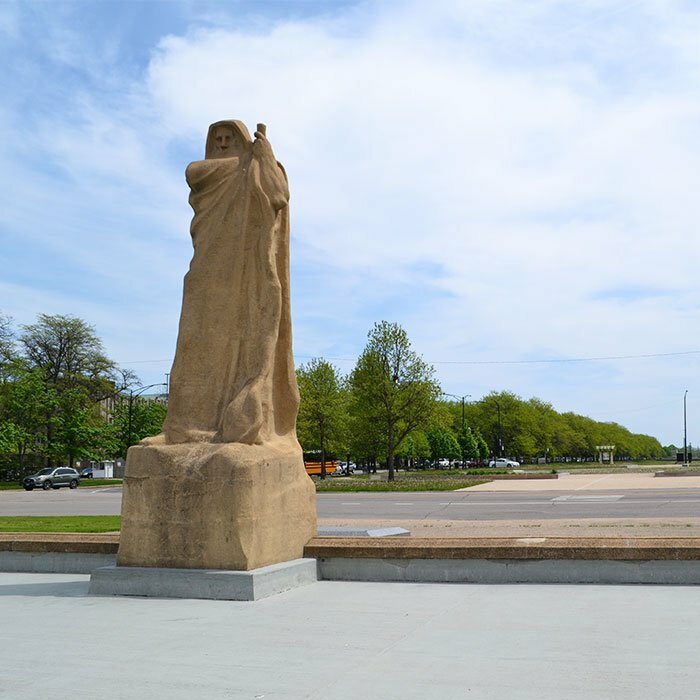 The finished monument is indeed colossal, with over eighty figures passing before the hooded figure of Time in a procession that is 120 feet long. 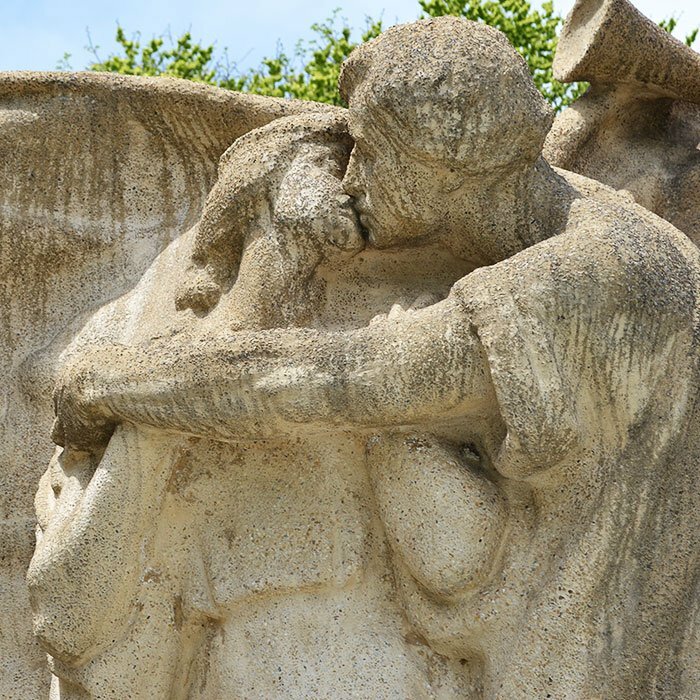 Aware of his own place in time’s inexorable march, Taft included a self-portrait within his monument, a small attempt in concrete at immortality.